Loving brights for Spring but love them even more when they are paired with neutrals. Here's what I've got my eye on! That is my favorite statement necklace! It would look amazing paired with that shirt. And those heels are fantastic. I'm so obsessed with your picks! Such a beautiful color! I think I need those Topshop heels asap! Ahhhh Zimmerman, never gets it wrong. OMG beautiful! I gotta have that Stella & Dot necklace... I love a neutral pallet! I'm totally into the blushtones for Spring! Can't wait for continuous nice weather! I love that top...I need something like that in my closet. love neutrals...and those toe capped pumps are calling my name! I love #4, 5, and 6. Really into pointy pumps and oversized blouses right now! Neutrals are great. Love very piece you chosen in this post. Wow. Those sunglasses are a must! OMG! The heels with the metal toecap are amazing! LOVE THEM! So charming selected pieces. Love those Asos sunnies so much. Number 5 and 6 are my favorite. 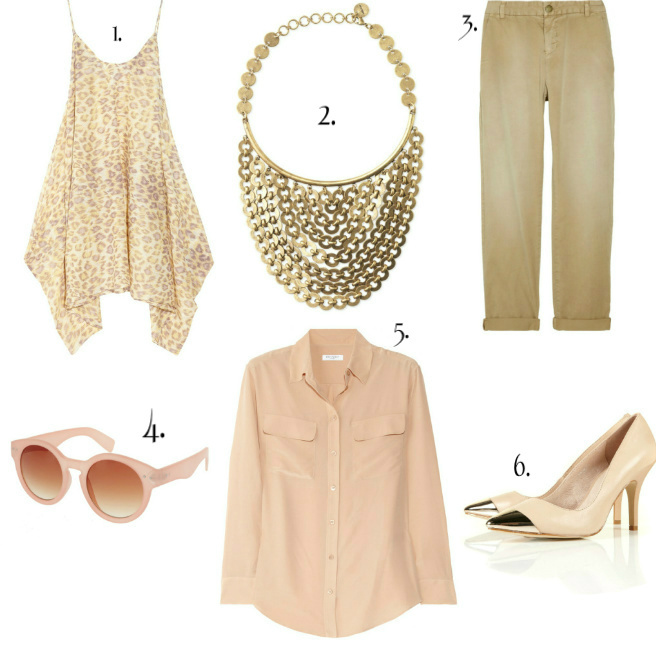 a good neutral blouse is such a great pieces to have. You really cannot go wrong with neutrals. Always chic + sophisticated. My favorite are those pumps. No contest. That leopard dress is swoonworthy! Loving all the picks awesome necklace!